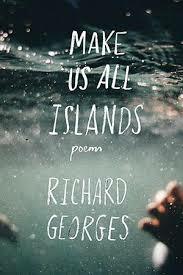 Trinidadian poet Richard Georges dispels the myth of the Caribbean as a modern-day paradise in his debut collection by invoking the ghosts and shipwrecks of his native islands in a sequence of darkly foreboding poems. to be mounted, to sing light into the bleakness. in pounds of iron-eyed grouper. This final line from the poem hints at the cost of such survival: an enforced break with the past, with the poet’s attempts to trace the story of his ancestors before they were plucked from their African homelands and thwarted by the obscurity of history. mark their place on the horizon. The ocean is a universe. An abyss consuming even light in its depth. except the histories of too many people. all of this is only water. Georges’ quest for identity and a place in his own timeline is beautifully rendered below a warm sun and the sound of the ocean – but as all sailors know, a tempest, literal or figurative, is never far away. At the emotional core of this collection is the poet’s own quiet rage against a storm which has passed, but whose devastation continues to be felt across the centuries. Highly recommended.